There is growing evidence that headwater stream ecosystems are especially vulnerable to changing climate and land use, but their conservation is challenged by the need to address the threats at a landscape scale, often through coordination with multiple management agencies and landowners. This project sought to provide an example of cooperative landscape decision-making by addressing the conservation of headwater stream ecosystems in the face of climate change at the watershed scale. Predictive models were built for critical resources to examine the effects of the potential alternative actions on the objectives, taking account of climate effects and examining whether there were key uncertainties that impede decision making. Results provide decision analyses that are (1) relevant to the management partners in question; (2) emblematic of landscape-scale cooperative decisions; and (3) sensitive to the practical consequences of climate change. The successful application of structured decision making (SDM) requires the involvement of resource managers at each step in the decision. By involving federal, state, local and non-profit management organizations, the PIs ensure that the decision outcomes are suitable for all involved. Though they may identify a decision which is not optimal for each management organization, species group, or protected area of a given watershed individually, collectively results will be able to satisfy the regional objectives for headwater stream systems. All SDM workshop materials are found on the project webpage at https://sites.google.com/site/headwaterstreams/. 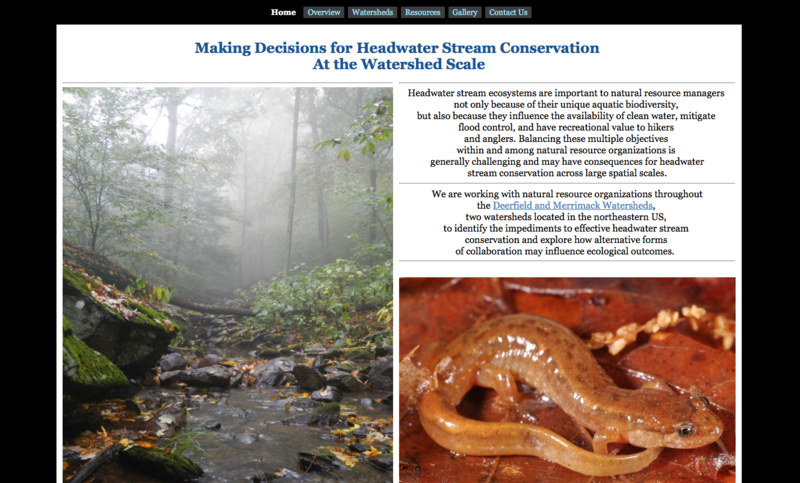 A webiste to help identify the impediments to effective headwater stream conservation and explore how alternative forms of collaboration may influence ecological outcomes. 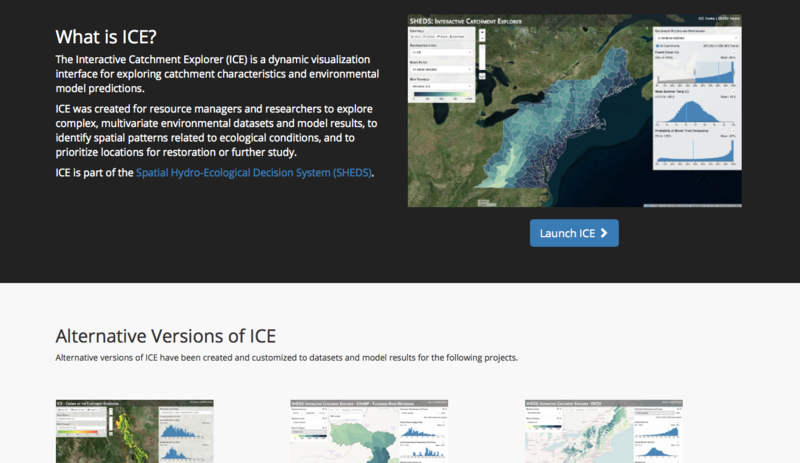 ICE is a dynamic visualization interface for exploring characteristics and predictions created for resource managers to explore complex environmental datasets and model results, to identify patterns related to ecological conditions, and to prioritize locations for restoration or further study. Grant, Evan. 2018. Final Report for Making decisions in complex landscapes: headwater stream management across multiple agencies. Amherst, MA. Linking science and management: Challenges and opportunities for the conservation of stream fishes. Seminar at University of Connecicutt's Department of Natural Resources and the Environment, October 2015. News: Decisions in Complex Landscapes: Deerfield Headwater Stream Workshop. March 13, 2015.